Ask your doctor about assistive devices you will need. Anesthesia will keep you pain-free and comfortable during the procedure. General anesthesia will keep you asleep during the procedure. Regional anesthesia will numb the lower part of the body. A cut will be made in your skin. The damaged cartilage and bone will be removed. The remaining bone will be prepared to receive the new joint made from material such as plastic and metal. The artificial joint will be placed in the proper position. It may be cemented within the bone. The incision will be closed with staples. A drain will be left in to allow extra fluid to flow out. Within 6 weeks, you should be able to go back to light activities and driving. You may feel a soft clicking in the joint when walking or bending. Continue to work with the physical therapist. Water-based exercises may help to improve joint pain, swelling around the knee, and range of motion. Antibiotics may be needed before certain dental procedures or surgeries now that you have an artificial joint. This will prevent possible infections from entering the bloodstream. Let your dentist or doctor know that you have an artificial joint. Knee replacement surgery procedure. Johns Hopkins Medicine. Available at: http://www.hopkinsmedicine.org/healthlibrary/test%5Fprocedures/orthopaedic/knee%5Freplacement%5Fsurgery%5Fprocedure%5F92,P07673/. Accessed March 27, 2018. Total knee arthroplasty. EBSCO DynaMed Plus website. Available at: http://www.dynamed.com/topics/dmp~AN~T360995/Total-knee-arthroplasty. Updated March 13, 2018. Accessed March 27, 2018. 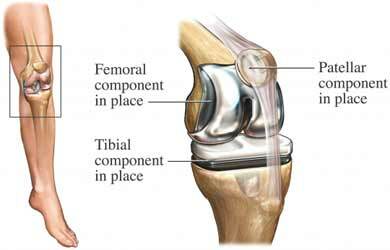 Total knee replacement. American Academy of Orthopaedic Surgeons website. Available at: http://orthoinfo.aaos.org/topic.cfm?topic=A00389. Updated August 2015. Accessed March 27, 2018. 4/16/2009 DynaMed Plus Systematic Literature Surveillance http://www.dynamed.com/topics/dmp~AN~T360995/Total-knee-arthroplasty: Harmer AR, Naylor JM, Crosbie J, Russell T. Land-based versus water-based rehabilitation following total knee replacement: a randomized, single-blind trial. Arthritis Rheum. 2009;61:184-191. 6/2/2011 DynaMed Plus Systematic Literature Surveillance http://www.dynamed.com/topics/dmp~AN~T360995/Total-knee-arthroplasty: Mills E, Eyawo O, Lockhart I, Kelly S, Wu P, Ebbert JO. Smoking cessation reduces postoperative complications: a systematic review and meta-analysis. Am J Med. 2011;124(2):144-154.e8. 9/16/2014 DynaMed Plus Systematic Literature Surveillance http://www.dynamed.com/topics/dmp~AN~T360995/Total-knee-arthroplasty: Abdallah FW, Chan VW, et al. The analgesic effects of proximal, distal, or no sciatic nerve block on posterior knee pain after total knee arthroplasty: a double-blind placebo-controlled randomized trial. Anesthesiology. 2014 Aug 5. [Epub ahead of print].